Several years ago, when I was studying Russian in college (a skill that has since vanished into the winds of time, I should add), I came across an interesting cultural tidbit. My Russian teacher, an effusive and slightly eccentric woman from St Petersburg who had a penchant for excess eye makeup and short leather skirts, told us that Russians have an unusual philosophy about food that went completely against the grain of anything and everything I had heard before. She claimed that in Russia the prevailing wisdom is that one should consume foods that echo the temperature outside, since this is far less of a shock to the body’s vital systems. "So consume plenty of hot tea in summer and ice cream in winter," she told us, "and you’ll be healthy and robust until you’re a hundred." Unfortunately, she didn’t come across as the most credible source on Russian folk wisdom, and I doubt anyone took her much more seriously than I did. Hot things in summer? Cold things in winter? This seemed like the ravings of a lunatic, particularly as my burgeoning culinary interest had exposed me to plenty of sources – cookbooks, magazines and television programs, chiefly – that advocated filling the summer table with ice-cold gazpachos, fresh tomato salads and endless pitchers of frosty drinks to beat the heat, while saving the promotion of hot and hearty dishes for the colder months. How on earth could the Russians think otherwise? Judging by the abysmally low position of Russian cuisine on the global preference scale, I decided to forget this piece of ‘wisdom’ as quickly as I could. And I did, until ten years later when we went to Jamaica. You might recall how I mentioned in passing that Jamaicans love soup. I think, however, that I failed to stress just how much they love it. I would go so far as to say that soup to Jamaicans is like bread is to the French; in other words, they can’t imagine a meal without it, and treat it not as a luxury or an afterthought, but as a staple. Indeed, on many restaurant menus in Jamaica, we were surprised to find soup listed not with the other appetizers but as a separate course, presumably to assuage any fears that you might be expected to forego your soup should another appetizer look tempting as well. In fancier restaurants these soup offerings could be anything, but were usually sophisticated, smooth and delicate – lobster bisque, puree of this-or-that, and of course the ubiquitous creamy pumpkin – while at humbler places it was pure belly-filler: pepperpot with pork and callaloo, red pea and potato, beef with dumplings. And of course, all of it was hot. Well, naturally we assumed that no person in his or her right mind would want to eat hot soup in this merciless tropical climate, which is why we spent our first few days deliberately steering clear of that section of the menu. When it became clear that we were seriously handicapping ourselves with our soup avoidance (and there was nary a chilled soup in sight across the entire country, it seemed), I decided I would have to give in – at least once – and ignore my better climatic instincts, since after all, I was there to sample as much Jamaican food as possible. So one night, with some trepidation, I ordered and began to consume a bowl of very delicious but very hot soup – I can’t remember exactly what sort – and before long the most remarkable realization came over me. In spite of all that steaming liquid in my belly, I actually felt cooler! In an instant I realized why Jamaicans love soup so much, and why Russians drink hot tea in the summer. I don’t know enough about biology to tell you why it works, but it does. Perhaps it all has to do with the temperature of the air suddenly being lower than the temperature in the stomach, or perhaps it is just the result of an explosion in sweat production that causes a skin-cooling surge in moisture evaporation, but whatever the reason for this miracle, I was thrilled to have discovered it, and never lost an opportunity to eat soup in Jamaica again. Which was a good thing too, since a few sweltering nights later, when we were staying at Marblue, Axel offered us a hot soup that turned out to be one of the most delicious things I have ever eaten: silky-sweet pumpkin enriched with the creamy richness of coconut and the haunting perfume of rum, everything set into sharp relief against a backbone of scotch bonnet. It was a soup for the history books – not to mention the permanent recipe file – whose secrets Axel was thankfully willing to share, and which I’ve been enjoying almost continuously for the last few weeks. And luckily, it is every bit as delicious in the altogether more benign warmth of a Scottish summer as it was in the sweltering heat of the tropics. Before I give myself over completely to the belief that my Russian teacher knew what she was talking about, however, I have one more test to run. I’ll give you a hint: it involves copious amounts of ice cream, and should commence in about five months. Then again, I just may start a little early on this one, since really, just because we embrace new philosophies doesn’t mean we have to completely abandon our old ones. r and set aside for several hours or overnight (in which case, refrigerate). 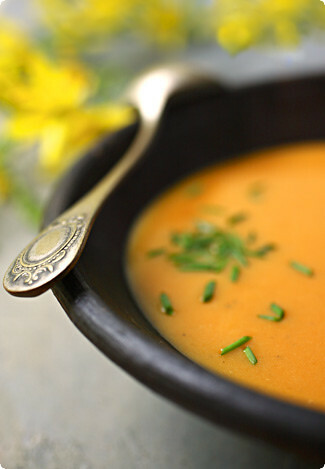 Just before serving, reheat the soup to boiling and let boil vigorously for 2-3 minutes. Serve hot with a garnish of thinly-sliced scallions or chives.